I am almost on my way on another wonderful succession of trips, but before I leave I thought it prudent to dish up at least another PhotoShare blog post. 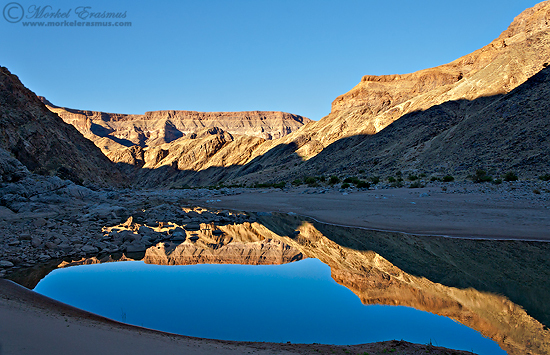 I was digging into some of my files for a submission for a calendar company, and came across this one from our legendary 2009 Fish River Canyon hike. This canyon in Namibia is the second-largest in the world, and the hike takes you over some arduous terrain in very harsh climates. Photography down in the canyon can be especially tricky, given that your essentially miss your "golden hours" of light due to the fact that you are walled in by the canyon walls on either side, and it takes a while for the morning sun to get high enough to reach the inside of the canyon, and in the afternoon it "sets" quite quicker than normal. The only really decent moments as far as light is concerned, are the few minutes that the walls are glowing before the sun climbs too high and starts baking down on you as you trudge across the canyon floor. This shot was from one such moment. The water in the Fish River was actually flowing quite nicely during this hike (which was at the start of the dry season). I managed to squeeze off this shot hand-held while my hiking party was leaving me behind!